Please refer to our stock # 1953 when inquiring. 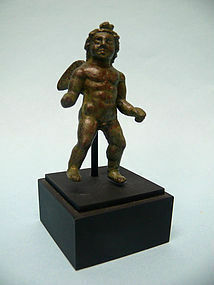 Small but stunning Roman Bronze Winged Cupid, ca. 1st - 3rd Century. Depicted as a young winged boy standing with weight on slightly bent left leg. Muscular body with outstretched arms. Hair pulled back in to a chignon and falling in ringlets. Loss of left hand but otherwise in very good condition. 2 1/2 high x 1 1/4" wide x 1 1/8" deep. On custom stand height is 3 3/4". The Roman god of love and the son of Venus. He is a small, winged boy, usually blindfolded, carrying bow and arrows. The arrows, once struck the heart, makes the victim fall in love. He is also portrayed as a young man with his beloved Psyche, with Venus or with a small group of winged infants (the Amoretti or Amorini). Some traditions say that he was born from a silver egg. His Greek equivalent is Eros. The name is derived from the Latin cupido, "desire".